A high-protein diet can help stimulate weight loss and muscle growth. Protein foods are filling and prevent spikes in your blood sugar that can cause cravings. Protein is made up of essential amino acids that support muscle growth, helping prevent the loss of lean muscle mass while you're on a low-calorie diet. Following a high-protein, 1,200-calorie-per-day diet should stimulate weight loss for most women, while leaving just enough calories for adequate nutrition. Always check with your doctor before starting a diet plan. The Institute of Medicine recommends consuming between 10 and 35 percent of your daily calories from protein. A high-protein diet plan focuses on the high end of this range -- about 20 to 35 percent of your daily calories. For a 1,200-calorie diet, strive for 60 to 105 grams of protein daily. Make sure you eat at least 1,200 calories per day, as this much is generally necessary for adequate nutrition. A high-protein, 1,200-calorie diet is not necessarily low in carbohydrates. You can still consume 45 to 60 percent of your calories from healthy, energy-providing whole grains, fruits and vegetables while increasing your protein intake. Fats are also an essential part of any diet plan. Try to make unsaturated fats, such as plant oils and nuts, comprise at least 20 percent of your daily calories. For a 1,200-calorie diet, you should consume a minimum of 27 grams of fat daily. Eat a minimum of three meals per day. If you go longer than four hours between meals, save some calories for snacks. 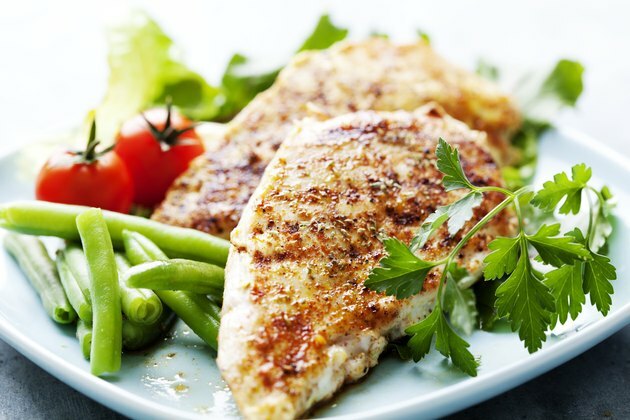 Each meal should contain 3 to 4 ounces of a lean protein source, such as shellfish, tuna, tilapia, pork tenderloin, beans, extra lean beef, turkey or chicken breast or egg whites. Pair your protein with a healthy, fiber-rich carbohydrate such as oatmeal, brown rice, sweet potatoes, quinoa or whole-wheat bread. Fresh vegetables or fruits, small servings of nonfat dairy and unsaturated fats should round out your meals. A breakfast on a 1,200-calorie, high-protein diet day might include three egg whites scrambled with one whole egg, a toasted whole-wheat English muffin and a small orange. At lunch, you could have a salad composed of 3 cups of baby spinach with 3 ounces of grilled chicken breast, 1/2 cup of pear slices, 1 tablespoon of chopped almonds and a dressing made from 1 teaspoon of olive oil with 2 teaspoons of balsamic vinegar. Have five woven wheat crackers on the side. At dinner, broil 3 ounces of halibut and serve it with 1/2 cup of cooked quinoa mixed with 1/2 cup of mushroom slices. Have 1 cup of sliced, steamed zucchini as well. For snacks, have 2 ounces of deli turkey wrapped in romaine leaves with fresh tomato slices mid-morning, and mid-afternoon, try dipping eight baby carrots into 4 ounces of nonfat Greek yogurt mixed with 2 tablespoons of salsa. This meal plan contains 1,221 calories with 88 grams of protein, which constitutes 28 percent of the calories. Carbohydrates comprise 46 percent of this day’s calories and fats, 26 percent.